BEIJING, China, October 22, 2013 (ENS) – Beijing drivers will be allowed to use their cars only every other day when a red air pollution alert is issued under a new emergency program announced Tuesday by the Beijing municipal government. The Beijing Municipal Heavy Air Pollution Emergency Response Program directs that cars with odd and even license plates will be allowed on alternating days and 30 percent of municipal cars will be banned from streets, also on an odd/even basis. During a red alert, kindergartens, primary and high schools will be suspended, and some factories will be shuttered. Fang Li, deputy chief of the city’s environmental protection bureau, told the state news agency Xinhua that the bureau would try its best to issue warnings 24 hours before days of heavy pollution. 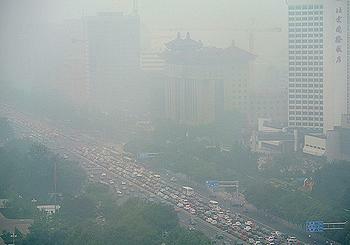 Vehicles are considered a major contributor to Beijing’s heavy smog. A research team from the Chinese Academy of Sciences estimated that vehicle exhaust fumes contribute 22.2 percent of particles under 2.5 microns in diameter (PM 2.5) in the city, greater than the city’s industrial emissions. The public transport system will have two million more passengers on emergency days, Fang Ping, deputy director of the Beijing Municipal Commission of Transport, told reporters Tuesday. Additional buses, trains and trams will run and public transport will be extended by 30 minutes to cope with the pressure, he said. The Beijing Municipal government today released a new version of its Heavy Air Pollution Contingency Plan to be activated in mid-November, when Beijing will enter its Winter Heating Season. Four alert levels are defined from the lowest to the highest: blue, yellow, orange and red. When there is heavy pollution for three days running, the highest red alert will be issued. Then 80 percent of government-owned cars must be taken off the roads and schools will be closed. 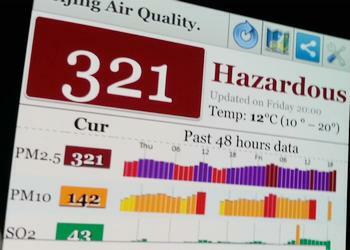 Air pollution alerts will reach the public via local radio, television, newspaper and on social media platforms. “We have made it very clear that when the second highest orange alert is issued, major polluters will have to stop production. We also have regulations to restrict the cars running on streets by the odd-and-even license plate rule,” said Yu Jianhua, director of the air department in the Beijing Environmental Protection Bureau. China’s air pollution problems are not restricted to Beijing. Seventy of the 74 Chinese cities monitored nationwide suffered from air pollution in the third quarter of this year, Chinese officials said today. The Ministry of Environmental Protection named the 10 cities with the most serious problems as: Xingtai, Shijiazhuang, Tangshan, Handan, Jinan, Hengshui, Tianjin, Baoding, Zhengzhou and Langfang, most of them near Beijing. East China’s Yangtze River Delta and South China’s Pearl River Delta have more clear days than other parts of the country.